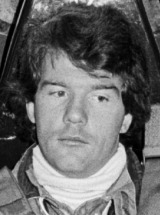 Warwick Brown competed in the 1976 USA Grand Prix, driving a Wolf entered by the Williams team. He finished 14th. He was more successful in the Tasman Series, which he won in 1975, driving a Lola T332 Chevrolet. He also won the Rothmans International Series in Australia twice, in 1977 driving a Lola T430 Chevrolet and in 1978 driving a Lola T332 Chevrolet, both for the VDS Team. In the course of winning these series Brown also won the 1975 New Zealand Grand Prix and the 1977 Australian Grand Prix.